MANILA, Philippines – The December 2017 Real Estate Broker board exam results including the full list of passers, top 10 examinees, top performing schools, performance summary of schools, among other related announcements are available at this website as PRC releases the results online two (2) working days after the last day of board examination. As announced, 841 out of 2,230 examinees passed the exams. The Real Estate Broker licensure exams are administered by PRC Board of Real Estate Service headed by its Chairman, Dr. Eduardo G. Ong and its members, Florencio C. Diño II and Rafael M. Fajardo on December 16, 2017 at PRC testing centers in Manila, Baguio, Cagayan De Oro, Cebu, Davao, Iloilo, Legazpi, Lucena, Pagadian and Tuguegarao. According to the Commission’s Resolution No. 2016-1019 series of 2016 entitled “Schedule of Licensure Examination for Year 2017”, the target release date of December 2017 Real Estate Broker board exam result will be few working days after the last day of board examinations, estimated in three (3) working days. However, results may also be released earlier or later without prior notice. On the same exams conducted by PRC on May 2017, results were released after two (2) working days. On February 2016, results were out after five (5) working days while during May 2016, results were released after three (3) working days. The schedule of online appointment for issuance of Professional ID and Certificate of Registration will be from January 3-9, 2017. Real Estate Broker is one of the programs with average number of examinees being administered by PRC. On the most recent exams of Real Estate broker conducted May 2017, 21 out of 55 (38.18%) examinees passed. During February 2016 REB exams, 5,499 out of 9,749 examinees passed. Antonio Felix Liyao Ortiga from Foreign University ranked first in the exams garnering a rating of 89.00%. He was followed by Elmer Tamoria Rabuya from Arellano University - Pasay having 87.75% and Louis Albert Begino Abecilla from Lyceum of the Philippines - General Trias, Cavite having 87.50%. On May 2015 of the same exams , 5, 220 out of 10, 370 examinees passed. Kenneth Gelonga Gersabalino from University of the Philippines Visayas-Iloilo City got the top spot having 86.50% rating. He was followed by Manuel Gepitulan Lisondra from Ateneo de Davao University and Voltaire Borja Salud from University of Sto. Tomas, both having 86.25%. Meanwhile below is the statistics of Real Estate Broker board exam results in the last five (5) years, courtesy of PRC. 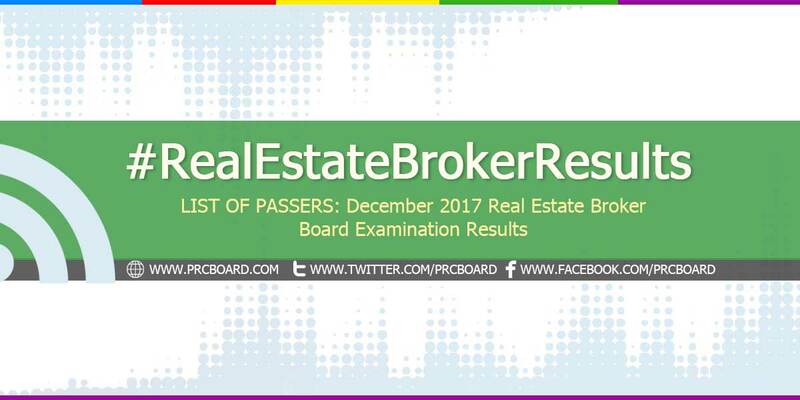 To receive up-to-date news on full results of December 2017 Real Estate Broker board exams, we advise our visitors to bookmark this page, visit PRC official website or follow us at our social media pages via Facebook and Twitter. I really wish I can pass this exam.